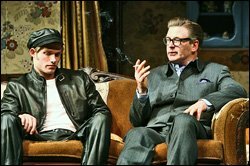 I have no doubt the smart artists involved with this revival had the best of intentions in taking on Joe Orton's comedy. But they seem completely tone deaf to its inherent subversiveness. Then again, what are the odds the subscription-juggernaut and tourist-magnet Roundabout Theatre Company is going to be able to faithfully represent a bleak moral indictment of empty middle class morality? Orton's tacky petit-bourgeois family unit doesn't live by a rubbish dump for nothing, you know. Yet--as Feingold rightly hones in on in his V.Voice review--that imagery is nowhere to be seen in Allen Moyer's utterly "charming" set. The sight of this homey, only slightly tacky living room, along with the Beatles tunes greeting you upon your arrival in the theatre, put you in the mood for a wacky Brit-com marathon on PBS, not searing social satire. As if taking their cue from the environment their directors and designers put them in, the actors back off the more outrageous and offensive things said, and therefore we in the audience almost lose the irony of such hypocrisy as characters castigating each other for using PG-13 swear words while planning the cover up of a murder! You know the text isn't playing "at the right speed" at the close of Act One, when the young stud Sloane mauls his aging landlady on the couch while she infantilizes him as her "baby" while begging him to give it to her. Orton wants it to elicit groans. Somehow in Scott Ellis' staging it just garners light-hearted titters before sending everyone off happy to the intermission bar. Alec Baldwin as the leering, closet-case of a capitalist, is amusing and winning as usual. But his half-assed tony accent and distressingly awkward on-stage fidgeting give the impression he thinks he's walking through another gig at Saturday Night Live. In such grotesque times as these Orton--a latter day Oscar Wilde with a touch of Genet--still has the potential to shock. But we as a culture have learned to assimilate British naughtiness so well post-Punk and post-Python. And post-Durang, the bar even in the American theatre has been raised on outrageousness. So Orton now requires directors able to kick it up a notch and dare their audiences to laugh at what disturbs them.